The name is derived from the Greek goddess of the rainbow, Iris. 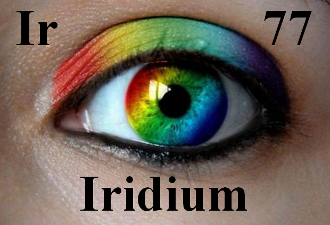 Iridium is a hard silvery metal and one of the rarest on Earth. It is almost as inert to attack as gold, and is used in special alloys and for the contacts in spark plugs. It also forms an alloy with osmium which is used for pen tips and compass bearings, It is the most corrosion-resistant material known, and was used in making the standard metre bar, which is an alloy of 90% platinum and 10% iridium. Iridium has a balancing and harmonizing effect on all levels of body, mind, and spirit. It is used to improve mental attitude and emotional states. Promotes improved cellular metabolism. Iridium is what makes your metabolism run faster, which in turn allows your cells to be corrected and to divide faster. Said to Promote enhanced mental acuity. Said to Support healthy tissue regeneration. May help encourage normal cell functioning. Feeling lighter, more energetic, needing less sleep, so on and so forth. Better ability to heal, knit tissue in case of injury. Better enhancement of all sensory apparatus in the body. More, overtime, psychic sensitivity and sensitivity to other higher frequency energies expect. Forms of Iridium, and its twin Rhodium account for some 5% or more of the dry weight of the brain. They apparently perform essential tasks as superconductors in a sort of nutrient-of-consciousness role. Iridium promotes improved cellular metabolism. It is believed to increase the electrical transmission across the synapses within the brain to improve memory, increase mental alertness and promote general tissue regeneration of the neurological tissues. Iridium is the crucible metal and it is all about staying true to oneself in changing circumstances or even in hell itself. Iridium is helpful when absolute resolve is required; and through this resolve remaining steady, the environment becomes changed instead. A great seed component when one requires a miracle to bring about the desired outcome. This is made from 10ppm Colloidal Iridium as a base. Then I preformed the John Hudson method by adding Organic Dolomite and swinging the PH. 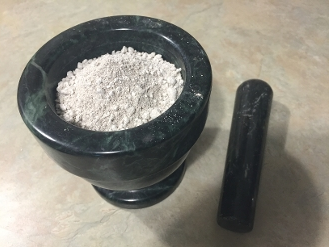 Then after washing it 7 times and drying it out, it is now a fine white Ormus powder that is extrememly high in Iridium.